Menchie's is the closest place to walk for frozen yogurt in our neighborhood. 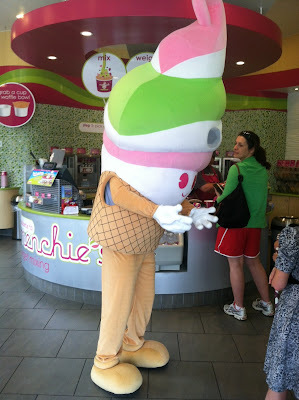 I had seen Menchie's in Atlanta but never actually tried it until we moved to Charlotte. Menchie's offers more flavors that many yogurt shops (flavors rotate) and has franchises in almost every state, Canada and in quite a few other countries. Many of the flavors are certified Kosher, which certainly makes it a popular destination in the Toco Hills section of Atlanta. I prefer the tart yogurts and recently enjoyed some plain tart with fruit from Menchie's. I wish Menchie's would offer a green tea flavor - my absolute favorite! Kids have fun here piling on the toppings and enjoying visits from the mascot! At this location there is even a room for a birthday party. I'm sure we'll be here plenty in years to come - although, a new fro yo place is opening soon less than a block away. Stay tuned.